Mills Free is a neat puzzle game for your Windows Phone that is simple to pick up, but a challenge to master. The game of Mills, also known as Nine Men's Morris, is one of the oldest strategy board games around. The game even landed a spot in the popular Xbox 360 title Assassin's Creed III as a mini-game. As far as the Windows Phone version is concerned, Mills Free offers you three levels of difficulty and if you only have time to play for a few minutes, your game in progress will be saved for when you have time to pick things up again. 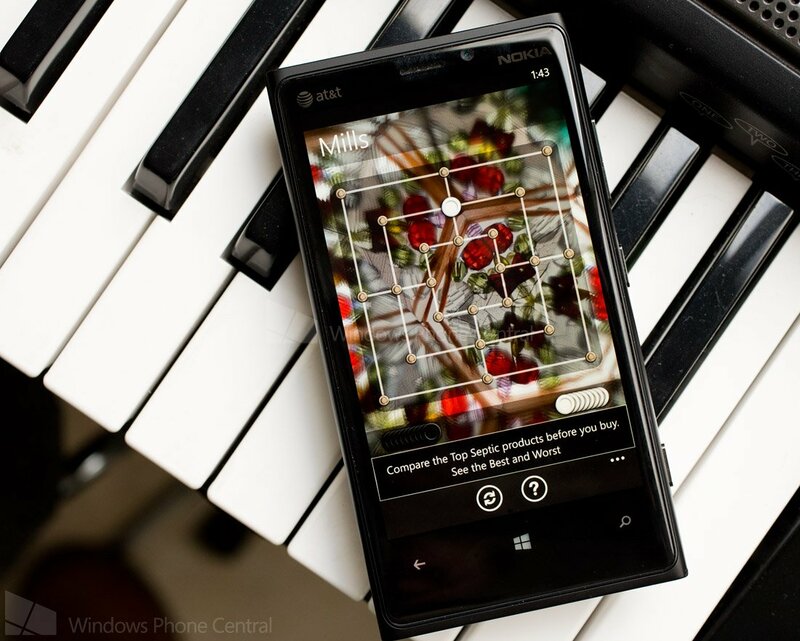 Mills Free is a challenging puzzle game for your Windows Phone and a nice addition to the Windows Phone gaming library. Mills Free's main pages include your gaming page that has your player ranking and options to resume a saved game or launch a new one from the three levels of difficulty (easy, medium or hard). You also have a Dashboard page that has links to the game's rules, leaderboards, settings and other apps from the developer. The game screen has your playing board and each player's game pieces at the bottom of the board. The board has twenty-four predefined positions where you can place (tap/hold and drag them into place) one of your game pieces. The goal is to line up three of your pieces vertically or horizontally. When you do, you create a "mill" and can remove one of your opponents pieces. The challenge of the game gets interesting when you have all your pieces on the board and in play. You can only move your pieces along the lines of the board to a free, adjacent position to create a "mill". You are allowed to break and re-create a "mill". The goal of Mills is to leave your opponent in one of two states; with only two pieces or unable to make a move. The game can end in a draw if a position is repeated three times. Mills Free is a fairly easy game to pick up but once you think you have a handle on things, the computer creates a "mill" and screws up your next move. It's a fun strategy game for your Windows Phone. Mills Free is a free, ad-supported game for your Windows Phone. 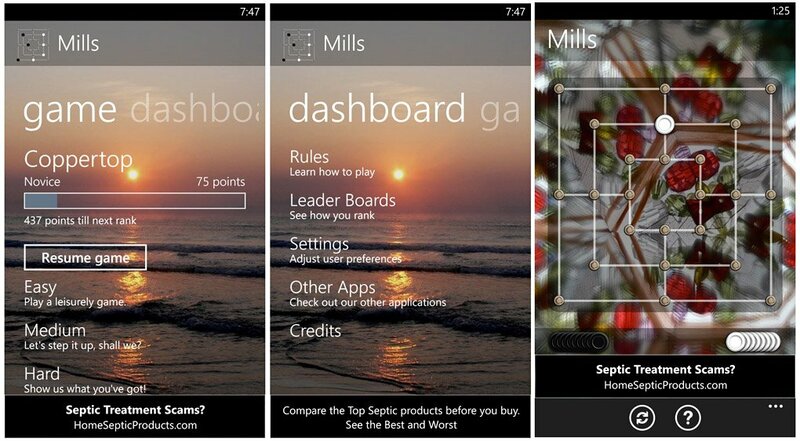 You can find Mills Free here in the Windows Phone Store.